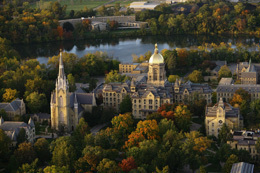 The Cooperative Computing Lab invites outstanding undergraduates to apply for summer research positions in distributed systems and biometrics at the University of Notre Dame. We create computer systems that allow many people to cooperate in the solution of problems that are too large for any single machine or person to attack. Using our testbed of 500 CPUs at Notre Dame, students will work with software and develop new techniques for managing computations that harness hundreds of machines at once. These tools are used to attack problems in disciplines such as high energy physics, organic chemistry, biometrics, and bioinformatics. We strongly encourage applications from women and minorities that are not well represented in computer science. We also encourage applications from students at regional colleges and universities. A summer research position is a great way to develop your skills and prepare for graduate school. This program will accept two applicants that will live and work along side a number of other REU students working on different research programs in our department. Our summer 2008 research will focus on the problems of distributed computing for biometrics. Biometrics is the study of identifying people from physical observations such as fingerprints, iris images, and motion capture. Researchers at Notre Dame have collected tens of thousands of such images and videos, and design new algorithms for identifying and matching people based upon these measurements. Answering these questions is very computation and data intensive. A large scale study of a new matching algorithm could take many CPU years to complete. To attack these problems in a reasonable amount of time, we must enlist hundreds of CPUs to work on different portions of the problem. While we have demonstrated the practicality of this idea with some custom programming, the overall system is not (yet) easy to use for end researchers. To solve this problem, the participants in this program will construct a well-organized repository of biometric data, connect it to our campus distributed computing system, and create an interface that makes it easy to specify and execute large biometric jobs. Applicants should be enrolled in a computer science degree program and be fluent in a systems programming language such as C or Java. Familiarity with databases, distributed computing, or biometrics is a plus, but not a requirement. Summer research students will be paid a stipend of $4800 for ten weeks during the summer term, 27 May 2008 - 1 August 2008. (Some flexibility in dates is possible if arranged in advance.) Students must register for a zero-credit (no fee) course, which gives access to campus resources such as housing, computing, libraries, and athletic facilites. The stipend should be used to pay for housing, meals, and other costs. Students may choose any housing on or off campus, but are welcome to take advantage of on campus housing (http://summerhousing.nd.edu) in order to meet other students involved in REU programs. Beyond the city, the South Shore Railway provides transportation to Lake Michigan and Indiana Dunes Park, as well as a direct stop in downtown Chicago, with easy access to museums, parks, and shopping. Students may bring a car to campus, but a car is not strictly a necessity at Notre Dame. 1 April 2007: Applications received by this deadline will be given first consideration. 27 May 2008: First day of summer research term. 1 August 2008: End of summer research term. Cover letter describing your interests and qualifications. Current resume listing education, experience, and skills. Letter of recommendation from your faculty advisor or the professor of a class in which you have done excellent work.